There are a multitude of Christmas picture books out there this time of year. There are many that celebrate the holiday and more secular aspects of Christmas. But there are also some wonderful and inspiring ones for your young readers that emphasize the holy day reverence that also is central to the observation of Christmas for many modern families. And Lee Bennett Hopkins has provided such a book for your young one. And it is called “Mary’s Song”, with its softly soothing and pastel palette of illustrations with hints of golden light by Stephen Alcorn. The illustrations dovetail beautifully with Lee Bennett Hopkins’ poetic telling of the story of the nativity. In his poetic take, that is both moving and maternal, Lee Bennett Hopkins’ picture book is viewed solely from the perspective of the mother, Mary, at the event of her son’s birth. It is filled with a simple humanity as your young reader can just imagine from the illustrations, the cacophony of noise, and yes, perhaps even confusion, that occurred in that tableau of the birth of Mary’s baby. Cows are mooing, donkeys braying, doves cooing from rafters high and shepherds are popping in for a visit with their sheep. Noises didn’t bother my babe. I longed to be alone with him. Here is Mary, displaying the most normal of human reactions to birthing. She merely longs to bond with her newborn in some semblance of peace and quiet! What could be more normal and relatable? Lee Bennett Hopkins rhythmic poetry and cadence, coupled with the soft and sleepy sense of Stephen Alcorn’s illustrations, provides your young reader with a renewed, yet realistic sense of the iconic happening in a stable in Bethlehem, where the human holds the divine in her arms like any other mother. Except, it’s a once in a lifetime occurrence that the picture book, Mary’s Song is able to convey so strongly, emphasizing the unique bond between mother and child and the intimacy that the moment of birth demands. 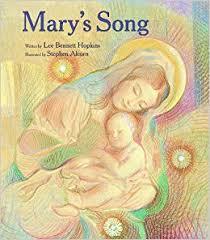 I hope this Christmas, Lee Bennett Hopkins’ picture book called Mary’s Song, finds it way both into your home, and into your young reader’s heart.